46 x 500 g bags/blocks 23 kg box frozen green tripe & chicken mince delivered to your door. Sent out by 24 hr courier in polystyrene box which keep the product frozen for 48 hrs. Packed in 500g bags formed in to frozen blocks, it makes it easy to store in your freezer. Simply take out the required amount and leave in your fridge overnight to defrost. Please note. if any one using tripe for the first time, tripe has a very strong odour. 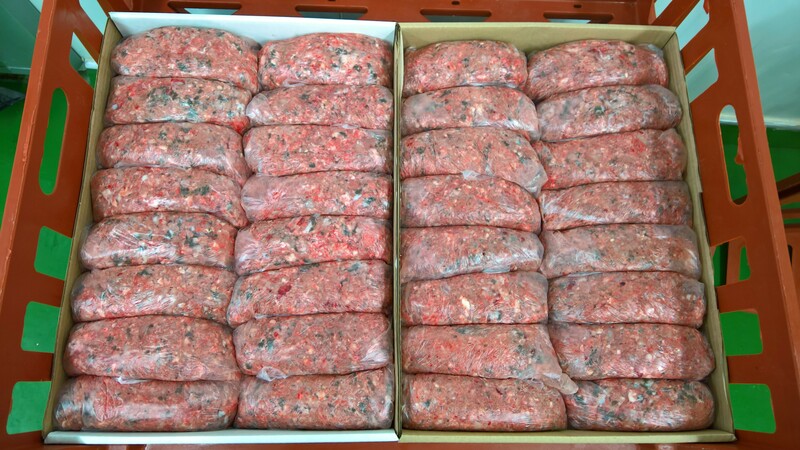 46 x 500 g bags/blocks 23 kg box frozen green tripe & chicken mince delivered to your door. Sent out by 24 hr courier in polystyrene box which keep the product frozen for 48 hrs. Our best selling chicken carcass mince with 100% fresh beef tripe Packed in 500g bags formed in to frozen blocks, it makes it easy to store in your freezer. Simply take out the required amount and leave in your fridge overnight to defrost. Please note. if any one using tripe for the first time, tripe has a very strong odour. PLEASE NOTE: We ship on Monday, Tuesday, Wednesday, Thursday. Orders placed on a Thursday afternoon, Friday, Saturday and Sunday or bank holiday will be processed and shipped on the next working day.